Launceston Golf Club | Launceston Then! The earliest recorded meeting in connection with the gold club was held on Monday, May 18th, 1908, at the Guildhall, to decide on the formation of a golf club for the town and district, and from that gathering came the action which eventually led to its establishment some seven months later. 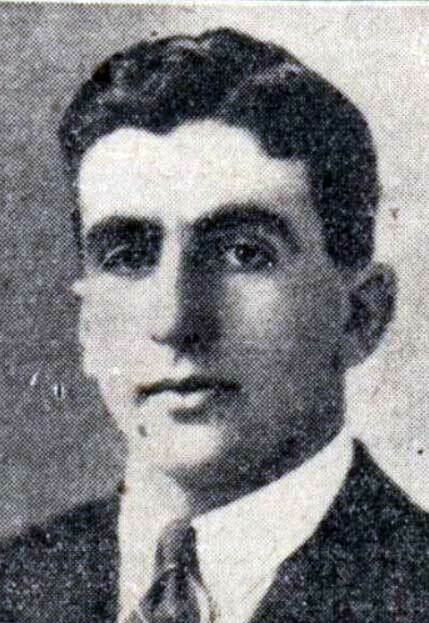 The first member was the Mayor of that day, Mr. W. H. Symons; the first secretary was Mr. H. L. Cowlard; the first president was Mr. J. C. Williams, of Werrington Park. It was in the latter part of 1909 that Launceston Golf Club began according to the late Mr. B. Willis. He was the first professional and green keeper, coming to Launceston in February 1910. The club had a membership of 60 with the subscription set at 1gn. a year. Mr. Willis was paid a retaining fee of 12/- a week, but he made his money up by tutoring new golfers and making golf clubs, being by trade a carpenter. These clubs were sold for 5/6d. each. Among those he taught was Jim Treleaven, and he remembered teaching him at 6:30 in the morning. The land was part of the Werrington estate owned by the Williams family and was tenanted to a farmer called Treleven. This early course was on the western part of the current course. Mr. Willis left Launceston in 1913 to live at Okehampton, but returned on his retirement to live at Chapple Park Terrace. Tuesday December 28th, 1909, is the precise date that a meeting was held in the Drill Hall at Launceston at which the draft rules were adopted and the report was forthcoming that the course was ready to play. It’s interesting to note the costing’s of those days: to making the tees and greens, £50. A similar sum would take care of annual upkeep, rent and compensation would cost £50 per year, so that it required a sum of £2 per week to keep the links going. It was also discussed for the golf course to be sited at Pennygillam instead of St. Stephens, but in the end the latter prevailed as the course host. During the First World War golf was suspended and during and after the war the course reverted back to agricultural use. It was the Launceston Chamber of Trade that help restart the Club in 1927, a date that is officially recognised as its birth date. In fact the possibility of reviving the golf course for Launceston was discussed at a Chamber of Trade meeting on January 11th, 1927, when a report was received from a sub-committee which had been appointed to deal with the question, and it was ultimately decided to ask the Mayor to call a public meeting to further consider the idea. The Chairman, Mr. E. Medland, said the sub-committee had gone around the district to view land with the idea of finding out which would be the best for the proposed golf course. They had visited different sites, and had come to the conclusion that the only suitable site would be the one at St. Stephens. They had accordingly got into touch with the tenant, Mr. Baker, who farmed the land on the site, and he was agreeable that they should have it. The hon. Secretary, Mr. W. E. Miller, presented the sub-committee’s report, to the effect that the committee had made a careful survey of the land within the vicinity of the town, and it was their unanimous opinion that the St. Stephens site was the most suitable for a golf course. The owner of the land by this time was Mr. A. M. Williams, M.P., who had been approached, and had given his consent for the land to be used provided arrangements could be made with the tenant, Mr. Baker. Mr. Baker had met the sub-committee, and agreed to let the land at a rent of £50 per year, and this was to include the cutting of the fairway when necessary, and to keep the hedges cut down. It was the opinion of the committee that if a company, with a capital of £300, could be floated, and a club formed with a membership of 100 and an annual subscription of approximately £2 2s., a golf course could be constructed and run successfully in Launceston. Replies were asked for by January 8th and, Mr. Miller said he had received several replies, which amounted approximately to £100 being offered so far from people he had written to and about 30 to 35 members. So far he had asked no member of the Chamber of Trade. Mr. J. Treleaven asked if they could have an estimate of the annual cost of upkeep. Was it proposed to keep a groundsman? The chairman said he believed they estimated it would cost £4 per week, including rent and groundsman. They were told they would very likely be able to get a groundsman cheap for the first year or two so that he would be able to say he had been in charge of a gold course. Mr. M. Hart asked how it was proposed to raise £200 annually. Did he take it the £2 2s. a year subscription would cover that? Mr. Miller; Yes, for 100 members. The usual subscription around here is from three to five guineas for an 18 hole course, and Bude, I believe, are putting it up to seven guineas this year. In reply to a question, it was stated that £300 capital was the minimum that would be required. Mr. Treleaven thought the first thing was to make sure of the capital, for unless they could get the capital it was useless to talk about expenditure and income. He thought the raising of the capital was the test of the interest that would be taken in it. If it could be definitely put before the public that a minimum of £300 was required, and that failing that the work could not be proceeded with, giving a certain date to ascertain the response, they would know where they were. It was no use for that Chamber or any other authority to undertake any liability on the site until they were sure of the capital, and also having some idea of the probable annual income. He would very much like to see it done, but before anybody took up any responsibility they ought to have some idea how they were going to get the money. Replying to the chairman, the secretary said the definite promise of shares so far was just over £100 worth. Mr. W. H. Bluett asked if it was suggested a public meeting should be called to consider the question. The secretary said if the Chamber adopted the idea of going on with the course it was thought they should have a public meeting. Mr. Treleaven said that would meet his point. Mr. F. Benoy asked if they were making any provision for visitors, or would they have to pay the full subscription? The chairman said there would be an arrangement for visitors to pay by the day or the week. Mr. C. Raddall asked if it was suggested that the Chamber of Trade should become the actual promoters of the club, and be responsible for it, or were they simply laying the facts before the general public? The chairman said that was all they were doing. The Chamber did not become responsible for it. As traders of the town they were trying to promote it, but were not taking responsibility as a Chamber. Mr. Treleaven said they would not be committing themselves except to call a meeting and submit a report, and if the meeting so decided they could form the company from that meeting. The chairman agreed, remarking that it did not even bind any member of the Chamber to interest themselves in it as individuals. Mr. Raddall thought Mr. Miller had been very successful in his letter writing. To obtain promises of £100 worth of shares and a membership of 35 was, he thought, a good lead for the public meeting. The chairman said he was inclined to think it was worth a trial. Asked by Mr. R. Folley if he thought a golf course would be a good thing for the town, Mr. Miller said they got a lot of people who would stay in Launceston if there was something to do, but now they just came and spent a day in the place and went away again. They got any number of people writing to know if there was a golf course at Launceston. Mr. Treleaven, proposing that a public meeting be called, thought after the trouble the committee and secretary had taken, and the replies they had received, they were bound to keep faith with them by giving the project the further chance of the whole thing being put before the public. If they could only get a representitive meeting it would be quite capable of deciding as to the advantages or disadvantages of the site, and the probabilities of success. He would move that they ask the Mayor to call a public meeting to receive the report of the committee, and to consider the possibility of making a golf course in Launceston. The resolution was seconded by Mr. Bluett, and carried unanimously. The matter next came up at the February (1927) meeting of Launceston Town Council, when Councillor G. G. Wilson expressed the hope that as many members of the Corporation as possible would support the Mayor at the public meeting to be held in connection with a proposal to provide a golf course for the town, as it was a question that affected the town very considerably. He was sure they would all agree that if they could possibly provide a gold course it would be to the advantage of the town, both from the point of view of extending the town and of trade brought into it, and he hoped all shopkeepers and traders would this time consent to be members of the club to be reformed, so that it could be run on proper democratic lines. Alderman K Hicks pointed out that many of them were already members of several other organisations, but Mr. Wilson retorted that if a place like Okehampton, which was smaller that Launceston, could with the assistance of its shopkeepers and traders, run a club with over 200 members, surely Launceston could. There was a gratifying attendance at a meeting held in the Guild Hall on Tuesday evening to consider the question of the provision of a golf course for Launceston. The Mayor, Mr. Horace Kittow, who presided, said whatever the result of that meeting might be, and he hoped it would be an enthusiastic success, they must thank at the outset the Launceston Chamber of Trade for having inaugurated it (HEAR, hear). They would know that for some years past the question of additional facilities for games and recreation had been prominently in the minds of the members of the Town Council, but nothing had been down. Within recent years the Chamber of Trade had been formed in the town, and were taking a very active interest not only in the financial welfare of the town, but in the recreations and pastimes of the inhabitants of the Borough. The Chamber had met and discussed the possibilities of starting and reviving interest in a gold course for Launceston. As they knew a golf course was laid out some years ago, and he had every reason to believe that had it not been for the outbreak of the war that club would have gone on and flourished, but the war caused a break in the continuity. Now, however, it had been taken up again enthusiastically by the Chamber of Trade. In the town at present they had various games and amusements which were all carried on very successfully, and he saw no reason why a gold club should not be carried on equally successfully. (Hear, hear). It was a game that appealed not only to the young, but to people of all ages, and had also been taken up by the ladies. In the proposed site at St. Stephens they had roughly about 50 acres to deal with. An address was given by Mr. C. G. Chard, amateur golf champion of Devon, who said he had been given some particulars by a friend who was an eminent authority, and which he read to the meeting. He dealt first with the possibility of starting municipal links, and then with a scheme on the basis of a private or public company. It was, he said, most important that the links should be situated as near the town as possible, as a first class course might be killed by its position. As to the cost of forming the land for their requirements, five men at an average of £2 a week should do all they require in five months, which was roughly about £200. After that it would be necessary to employ two men to look after the links, one of whom could be the professional. The joint cost would be about £200 per annum, which was probably about £25 too much. The annual subscriptions should be sufficient to provide at least £200 per annum. The benefit to be derived by the inhabitants of the town by the provision of a golf course was a matter which should weigh with the promoters. In the spring and right through the summer nearly every car passing through the country districts could be seen to be carrying golf clubs, and the first thing people asked when they came to a town was whether there was a golf course. If there was a course, it was doubtful whether people passing through would leave without playing a round, and this brought money into the district, and was a benefit that could not be overlooked. At the same time, businessmen, as well as those with more leisure, could find a great deal of pleasure, to say nothing of exercise in the game, and there was no doubt that golf links created a great amount of good feeling and interest, and undoubtedly made for a happier community. (Hear, hear). Mr. A. Y. Oag said he took it the £200 mentioned for the laying out was for an 18-hole course, but they proposed to have a 9-hole course at Launceston. Mr. Chard said he had had a look at the proposed course, and could see very little difficulty in making it on the site. It was doubtful whether they would get a satisfactory 18-hole course there, and he should advocate a 9-hole course to begin with. Replying to Capt. Bonell, Mr. Chard said he thought the soil on the proposed course was capable of being played on all the year around. Mr. H. M. L. Hutchinson asked if he understood Mr. Chard to say that they would be able to run a course of that nature on 3200 a year. Mr. Chard: Yes, I think you should, and that would include wages. Mr. E. Medland (Chairman of the Chamber of Trade) said he believed when they interviewed the tenant of the land the rent he asked included cutting the fairways and keeping the hedges cut. That would keep down the expenditure somewhat. Dr. W. F. Thompson asked what animals they were going to allow on the course. Was it to be only sheep, or bullocks and horses as well? If they were going to allow bullocks and horses the course would not be worth playing on. Mr. Medland said he understood the tenant guaranteed there would be no horses on the ground, but he believed he claimed to put cattle in the fields. Mr. W. E. Miller (secretary of the Chamber of Trade) said he thought the trouble was that the tenant of the land could not keep cattle off for the £50 a year rent which it was proposed to pay, but if they could see their way clear to raise the rent to compensate him he would be only too glad to graze sheep only. Mr. Chard thought if they could come to some arrangement to keep cattle off at certain times in the year, it might not be so bad in the summer. If they had cattle on the course in the winter months it was going to make a lot of work. Mr. G. G. Wilson said one thing he wanted to impress upon the general public was the great advantage it was to a town to have a golf course, and he was perfectly convinced that if the traders in the town would only join the scheme, so that they could get a proper membership to run the course, they would more than get their subscriptions back by the end of five years in extra visitors and residents in the town. (Hear, hear). If a town of the size of theirs had not a gold course, then if they were not going back they were at any rate remaining stagnant. Intending visitors to the town asked the one eternal question. “Have you a gold course?” And he was certain lots of people never came near Launceston because there was no golf course. It was a great surprise to him before the war to find that such an extraordinarily small portion of what he called the shopkeepers in the town were members of the club they had. He did not know what the reason was, whether they thought it was an exclusive society carried on by the supposedly rich, but only about three who were traders were members. Since then times had moved, and they had to look at things as they were in the present day, not as they were before 1914, and he thought they would all agree that in all spheres of society there was a much more democratic feeling about, amongst the public — (hear, hear) — much more of the hail fellow well met, and whether a man was a gardener or a shopkeeper, or happened to be a banker or lawyer, they all joined together on the golf course, and played together. (Hear, hear). He wanted the residents of Launceston to try to realise that if they had a golf course it had to be supported on those lines, or else it would not be any success at all. (Hear, hear). One fly in the ointment was the question of having cattle on the course, and he thought it was absolutely essential that they should try to make some arrangement with the tenant so that the cows could be kept off at any rate during the five winter months, from November to March inclusive. He would like, on behalf of the residents, to express their thanks to the Chamber of Trade for their work they had done in connection with this proposition, for he really thought if it had not been for their work the town would have gone on for many years without anything being brought up. If the proposal was entered into in a democratic spirit, and the course made a success, they would shortly find a lot of the houses in the town which rather hung fire when offered for sale, taken up by retired gentlemen, who were only too ready to come to a place like Launceston where they could get golf, as well as fishing and a little shooting. (Hear, hear). Mrs. Glennie asked if the proposed course was likely to be sufficiently good to attract visitors. The Mayor said the Chamber of Trade had considered every likely or possible situation, and they had come to the conclusion that this was the best site obtainable. The beautiful view to be obtained from the course would make it attractive to anyone who did not want to play golf, and as to its attractions from a player;s point of view, he gathered from what Mr. Chard had told them that with moderate expense they could get a course there which would be attractive to players. (Hear, hear). Mr. Gerald Peter asked if they were secured as regards the land. They did not want to lay out a lot of money there, and be turned out in 7 or 10 years. (Hear, hear). Mr. Medland said they had not got as far as obtaining any lease yet, but he was sure they would have a most sympathetic landlord. (Hear, hear). Mr. W. E. Miller, giving a report on the response to the appeal which had been made for financial support, said the Chamber had realised the need for something of this kind for a considerable time. They had tried to get hard tennis courts, but unfortunately, through not being able to get a site, that fell through and they really could not put a proposition to the public which they could recommend. There seemed to be no way of getting over the difficulty, and very reluctantly they had to drop it. It was then suggested they should try to get a golf course, and a sub-committee searched all the way around, and came to the conclusion the only place was at St. Stephens. They thought, instead of going straight away to a public meeting, they would test what support a course would get if it was formed, and he sent out about 150 letters. In the appeal they suggested a course could be run if they could float a company with a capital of £300 and get a membership of 100 at an annual subscription of two guineas. In response to that, he had received offers of £150 in capital, and 52 people had promised to become members. (Hear, hear). He thought, therefore, there was plenty of reason to go ahead, and there should be very little difficulty to get the other £150 capital and the other 50 members. He felt sure if they could do that it would be a great attraction to Launceston. They got many enquiries from visitors as to whether there was a golf course, and also many enquiries about houses from people who said it was a lovely district, and they would like to live there, but there was nothing to do. People said if there was only a golf course in the place they would come there to live, or would build houses there, but they would not do it unless some sort of recreation was provided for then. The mayor thought the report was a very gratifying one. In a subsequent discussion, Mr. Chard said he thought the £300 capital and £200 a year coming in was quite a good figure on which to launch the scheme. The Mayor said it was thought to divide the £300 into £5 shares. Dr. J. A. R. Glennie, proposing that they carry on with the formation of the club, said he was the wrong person to do it, for he could see that when it was going on and flourishing there would be no patients for him at all. (Laughter). Mr. Oag seconded, and the resolution was carried nem, con. On the motion of Mr. J. Treleaven, seconded by Mr. Gerald Peter, the following were elected a committee, with power to add: The Mayor (Mr. Horace Kittow), Dr. Glennie, Dr. Thompson, Capt. Bonell, Messrs. E. Medland, G. Wilson, A. Y. Oag, T. J. Llewellin, W. E. Miller, E. Barriball, Stuart Peter, R. Waller, H. M. L. Hutchinson, J. H. Treleaven, J. Harvey, Mesdames Strong, Birch, Llewellin, Glennie and Miss K. Lewis. Thanks were proposed to the Mayor, Mr. Chard, and Mr. Wilson by Mr. Medland, who said in addition to a golf course he would very much like to see hard tennis courts as well — (hear, hear) — and possibly in the near future the Council or someone else might take that question up. Dr. Thompson seconded, and the resolution was carried. The Mayor, replying, appealed to those who had not yet taken up shares or become members to do so. Mr. Wilson said thanks were due to Mr. Miller for the work he had done, and he would like that meeting to ask him if he would be good enough to act as secretary to the new committee. (Hear, hear). Mr. Miller said he could not possibly carry on as secretary. He found his duties as secretary to the Chamber of Trade took up practically the whole of his spare time, and he could not neglect one to carry on the other. He was very interested in the golf scheme, and all he could possibly do to help would be done — (her, hear) — but he thought someone else who had had more experience of the work connected with a golf course should take on that responsible position. The golf course is now sufficiently far advanced to enable the president, Mr. A. M. Williams, M.P. (left), to perform the opening ceremony on June 2nd, at 2:15 p.m. As the club did not have possession of the site until the end of March, and work was not commenced on the links till Easter Tuesday, the rapid progress of the scheme,despite the dry weather, reflects great credit on the committee and the professional, F. W. Hearn. The length of the 9 holes will be nearly 2,300 yards, and will prove a good test of a players capabilities, and the bogey will probably be fixed at 35. While the course will not be too exacting for the beginner, the experienced player will find he must be on his game to do the holes in the correct figures, as these are all of a sporting nature. Plans are being prepared for the erection of a club house, which will provide rooms for both the lady members and the men members, and a general room in the centre. The committee hope to have this complete by the early autumn. F. W. Hearn, late of the Saltash G.C., Has been engaged as professional and is supervising the work on the course. In addition to being an excellent player, and holding the professional record of Saltash links, he is well known as a very good tutor and this will be of great assistance to beginners at the game. In the presence of a gathering which included the Mayor and Mayoress (Mr and Mrs H. Kittow), the Launceston Golf Course was officially opened on Thursday by Mr. A. M. Williams, M.P., who was welcomed on behalf of the club by Mr. G. G. Wilson, who in a short address, said he wished to express their appreciation to Mr. Williams in coming there that day to open the course, in spite of his numerous duties. He thought that they had a fine course, and he had to express his thanks to many people, especially to Mr. H. M. L. Hutchinson (hon. Secretary), and F. W. Hearn, their professional, for the excellent work they have done. He also expressed his thanks to Mr. Chard, the amateur champion of Devon, for coming to give them an exhibition match with their first professional. The first drive on the course was then taken by Mr. Williams, immediately following which the exhibition match between Mr. Chard and Mr. Hearn started. The conditions were excellent for the match, the heat being tempered by a pleasant S.W. Wind. Mr. Chard played a very fine game. Owing to the work on the course, Mr. Hearn had had opportunity to practice for several weeks, but despite a bad start he carried his better known opposition to the 16th green. In a competitive match Mr. Chard was the eventual winner. After tea, Mr. Williams and Mr. Chard in a four over 9 holes by Mr. Wilson (captain) and Mr. Hearn on the last green in a very close match. Interviewed after the match Mr. Williams said he had thoroughly enjoyed the afternoon with exception of the ordeal of driving the first ball off in the presence of such a large crowd, and that he thought the opening of the new course marked an important advance in the sporting and leisure life of Launceston. In addition he thought it would attract visitors to the town, which would be good for its trade. 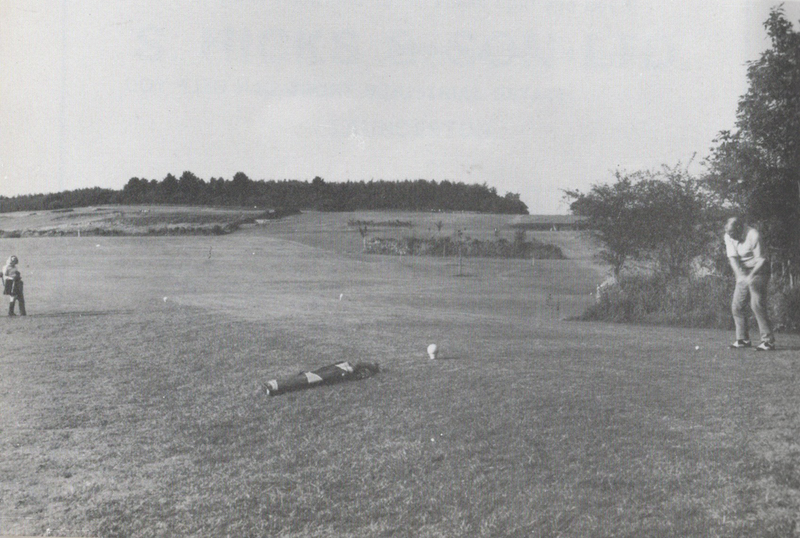 Speaking as a player, Mr. Chard said that he considered the layout of the course very good, and the natural features had been put to the best advantage. The result was a very sporting course, which in time would develop into excellent inland links. The progress made in such a short, he regarded as remarkable, and he thought the course would prove to be an attraction and asset to the town. 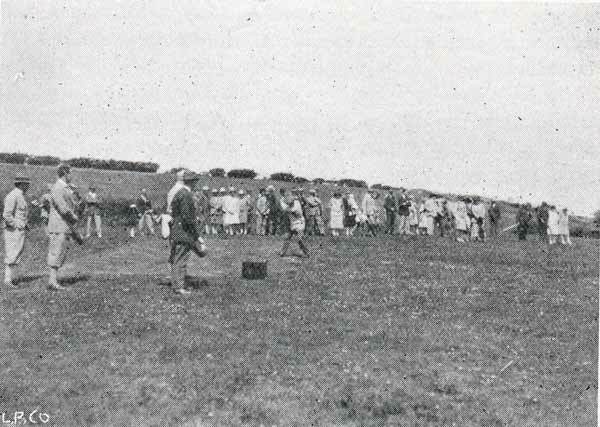 Teeing off on the Launceston Golf Course in the late 1920’s. Over the years the course developed into a nine hole layout starting at the current second hole, with the ninth green and Clubhouse around the area of the current 16th green and 17th green. 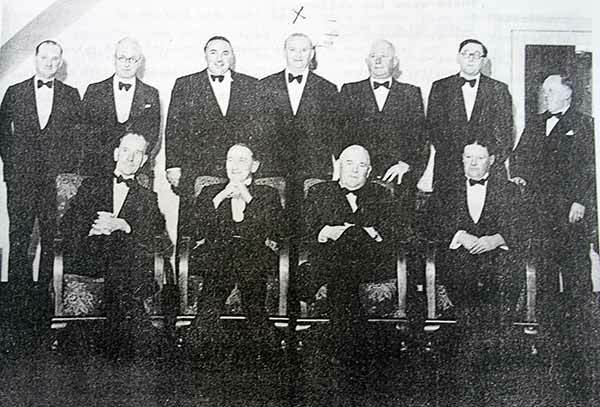 Line up up of past Launceston Golf Club Captains at the annual dinner in 1951. Standing left to right: Reg Prout senior, Bill Matthews, Roger Parnall, Stuart Peter, Bill Kivell, Ted Longman, and Fred Smith. Seated: Phil Sanders, George Wilson, Tom Fulford and John Dingley. 1962 annual dinner of Launceston Golf Club. 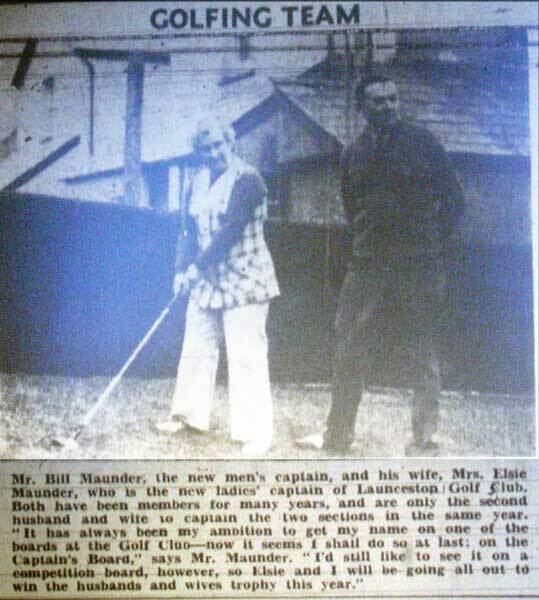 Bill and Elsie Maunder on being made Captains of Launceston Golf Club in 1976.